The electronic systems that can operate with very low power are of great technological and scientific interests. 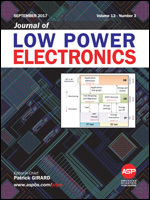 The growing research activities in the field of low power electronics require a forum for rapid dissemination of important results: Journal of Low Power Electronics (JOLPE) is that international forum which offers scientists and engineers timely, peer-reviewed research in this field. JOLPE is an international open access journal and is published quarterly by American Scientific Publishers (ASP). Open access: free for readers, with article processing charge (APC) paid by authors or their institutions. High visibility: covered by Web of Science ESCI, Scopus, Compendex, Google Scholar, etc. Rapid publication: manuscripts are peer-reviewed and a first decision is provided to authors approximately 45 days after submission. Please read Instructions for Authors before submission. PLEASE READ THIS NOTE BEFORESUBMISSION: Manuscript processing fees of US$ 550 per article for all Countries. Please read "Instructions for Authors" for more details. Hereafter, online submission to the journal is assumed that authors fully agree to pay US$ 550 manuscript processing fees for articles upon acceptance.